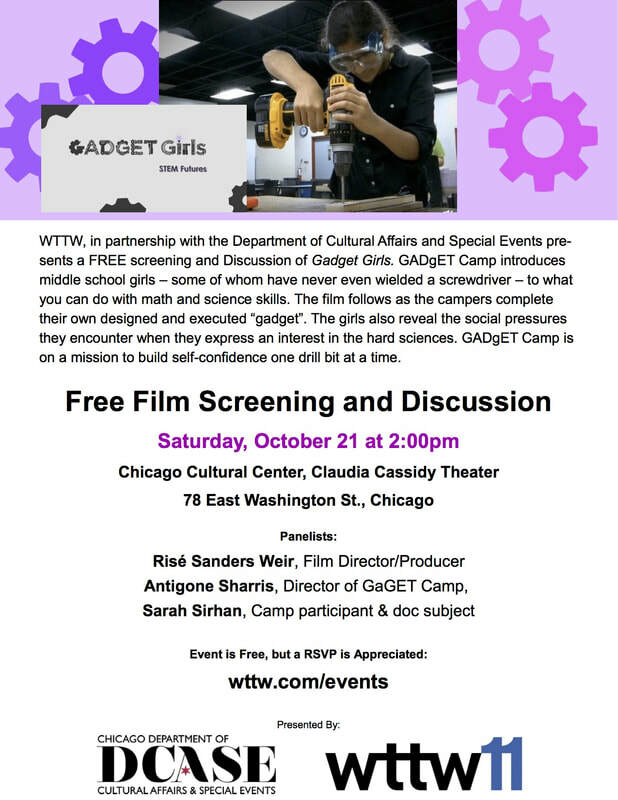 The day before on October 21 - 2p - a screening and panel discussion will be held at the Chicago Cultural Center. See the flyer below for more information. GADgET Camp introduces middle school girls – some of whom have never even wielded a screwdriver – to what you can do with math and science skills. The film follows as the campers complete their own designed and executed “gadget”. The girls also reveal the social pressures they encounter when they express an interest in the hard sciences. GADgET Camp is on a mission to build self-confidence one drill bit at a time. Success in “hard” sciences takes work, perseverance and a belief that the end will be worth the effort. There is a historical deficient of girls in the fields of science, technology, engineering and math. In the last decade there has been a concerted effort by educators, government funders and parents to get girls interested in pursuing careers in the so called STEM fields. But what’s holding girls back? Former Harvard President Larry Summers suggested in 2005 that it was due to innate differences between men and women. That women naturally, genetically are less proficient in math and science. Standardized tests of school children don’t bear this hypothesis out. At an early age girls are even with boys on test scores, but as they grow into the teen years girls start to fall behind. What propels that decline? Malcolm Gladwell proposes in his book Outliers that, “Practice isn't the thing you do once you're good. It's the thing you do that makes you good.” And, “In fact, researchers have settled on what they believe is the magic number for true expertise: ten thousand hours.” So when girls are being subtly turned away from the hard sciences in middle schools and high schools across America, they are loosing the chance to become good at it. Peer pressure, the desire to be liked by boys and just the fact that it’s hard all contribute to girls not getting their 10,000 hours of practice. We, as a country, have made it a priority to get girls to excel in these areas. But what do they really need in order to stay the course? GADgET Camp is one route. It stands for Girls Adventuring in Design, Engineering and Technology (the lowercase “g” is just there to make it a fun acronym). This camp introduces 6th–8th grade girls, some of whom may have never wielded even a screwdriver, to what you can do with math and science skills. It gets the learning out of the classroom and into the workshop. All the while building their confidence, so when they go back to school they are less intimidated. Gadget Girls: STEM futures follows the course of the week at camp. Girls arrive with varying degrees of interest and expertise. Some have never used a tool; others have be soldering electronics in their bedrooms for years. The film follows their path of discovery through to completion of their own designed and executed “gadget” at the end of the week. Sioban realizes that she has to rethink her project due to the wattage needed to run her light board. Akeelah has to create parts for her project that aren’t readily available. Breanna has to learn how to solder (and how to pronounce it). Sarah, Grace and Rena tell us about the pitfalls of being a girl interested in science and math. The goal of the camp is to create the confidence the girls need once they are back in the classroom head-to-head with boys, who feel more confident there. The goal of this documentary is to shed light on the social pressures that are holding girls back from STEM careers. This film will inspire girls to stay the course, keep learning and practicing, and arm them with real-world knowledge about how to succeed in what still is a man’s world.